Renew, Redo....Getting a little more brave! Last week, I dipped my toe into the Ocean of Chalk Painting as I am renovating my bedroom. 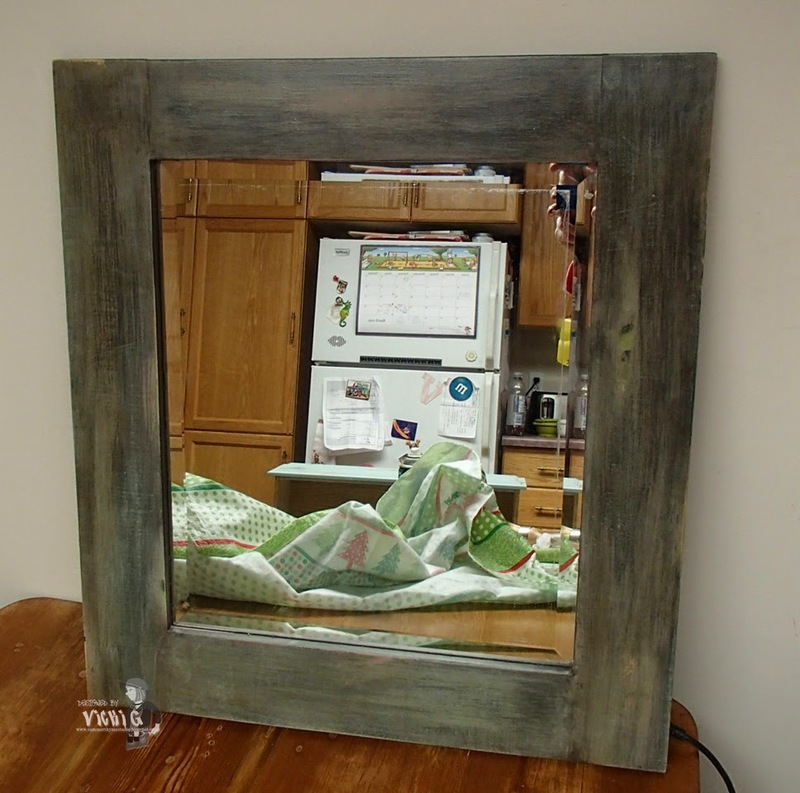 This fine gem of a mirror definitely doesn't meet the "Coastal" Theme. It did however, look quite nice over my green Formica Vanity. That was in 1997! 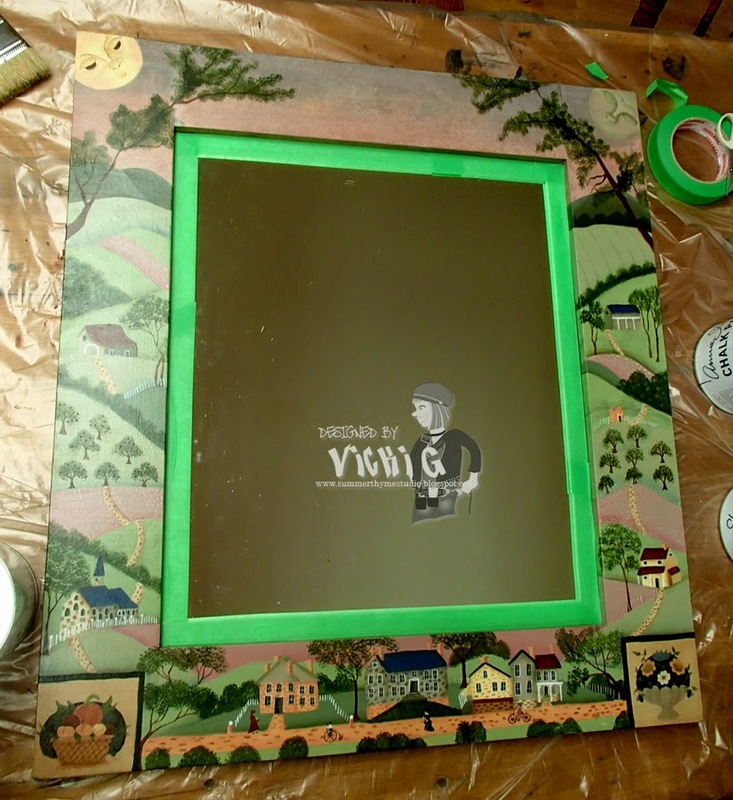 I would say that I had invested around 40 hours into tole painting this frame. My initial thought was to put it in the next yard sale, but then my not only lovely, but bright mother mentioned that I should repaint it! Well of COURSE! Renew, Redo! 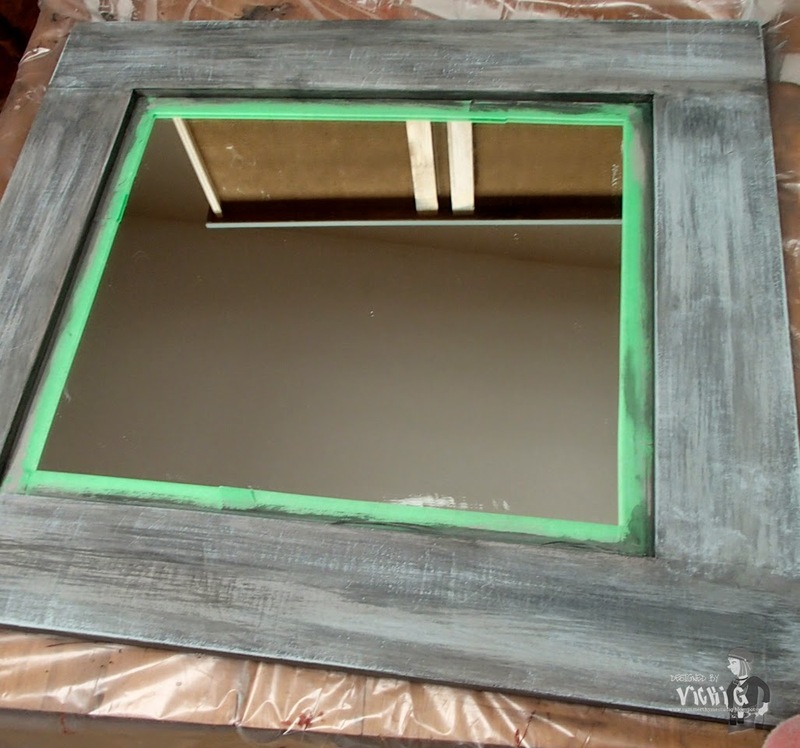 Also, the pittance that I might receive for the clearly dated mirror wouldn't amount to the cost to replace the beautiful bevelled mirror that I had installed into the frame. 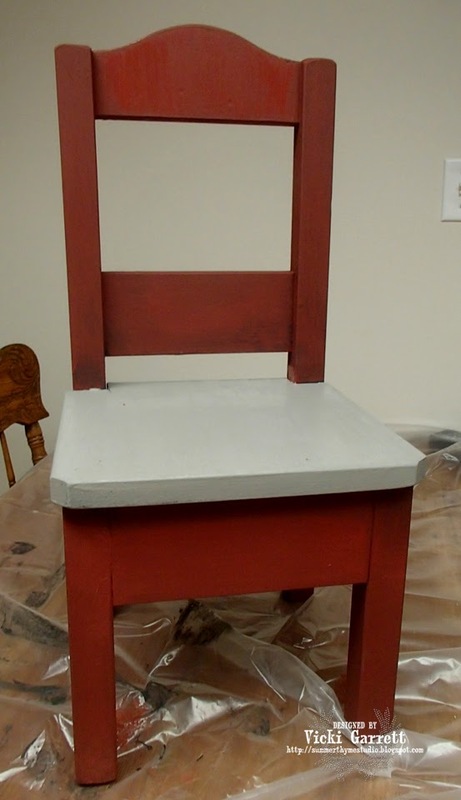 Last weeks project, the chair was all about playing around with the paint and getting the "feel for it". Funny, I've always felt that there is a distinct feeling when applying paint and knowing that you are going to have success with it. That may sound weird, but in my Tole Painting days I knew that a shadow that I was laying down would be perfect, because I felt it! I started by applying French Linen and Duck Egg Blue wet into wet, using two brushes. For this technique, I didn't paint right out of the can, but rather poured some paint onto plastic plates as I didn't want to contaminate my lovely paint! I have much more in store for it! After cleaning my brushes well, I made wash out of Graphite Paint. 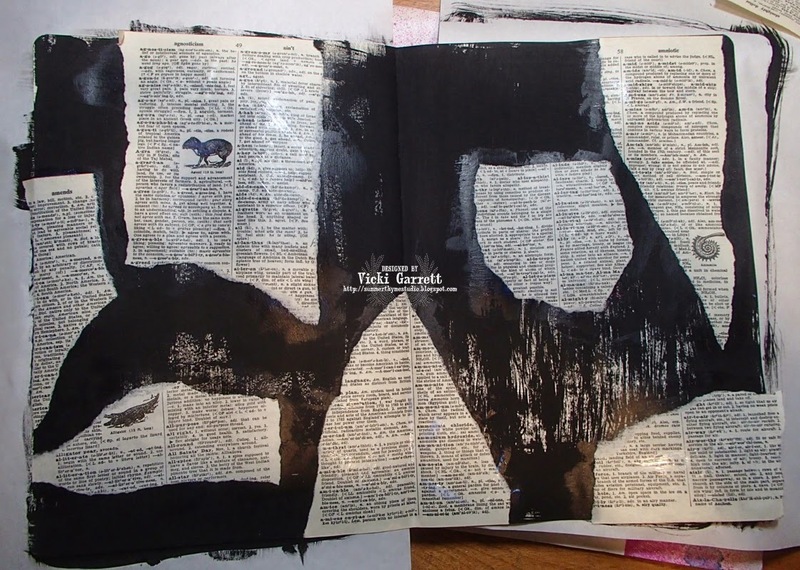 I added about a Tablespoon of Paint into a paper cup and about 2-3 tsp of water. I went over the frame here and there to add some dark texture in. I found it a touch dark and so after letting it dry, I dry brushed in a little more Duck Egg Blue....DELICIOUS!!! My next step- To sand and distress it up a touch. There are a couple of places in which the "Old" Paint showed through. I was initially going to go back in and try to cover it up, but then I thought I kind of liked the look and decided to let "nostalgia" shine through. 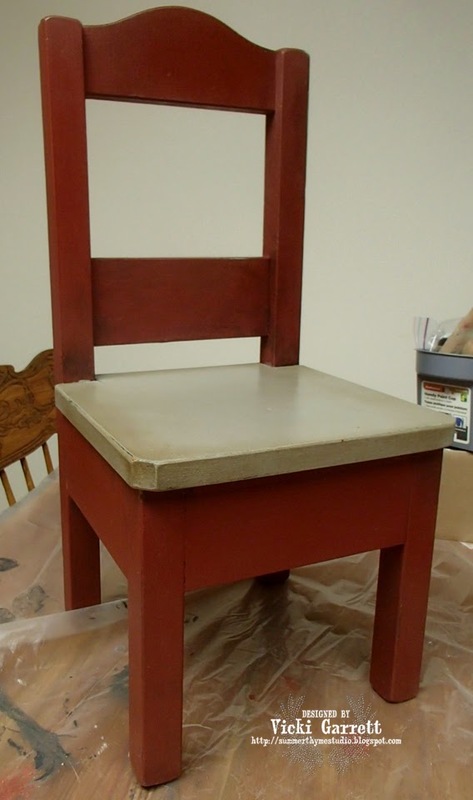 In fact I then got a little more aggressive with the sandpaper and removed more paint in several places. It's still looking a little rough pre wax, but I had faith that it would turn out. I wanted to have a little darker look, so I mixed my wax at a ratio of one tablespoon of clear wax, with a smidgen of dark wax! I'm actually VERY pleased with the final project! Must apologize for the picture, but I couldn't find a bare space to take it, with all the reno's going on~ When it makes it to it's proper place, It will warrant another share! Thanks for looking and stay tuned for more projects! A dear Friend of our Family is turning 85! My Mom asked me to make her a pretty card " You know" she said, "one of those special ones, with all the flowers and ribbon and such"! So here is is. All Birthdays' warrant a pretty card, but I think an 85th warrants an extra special one too! 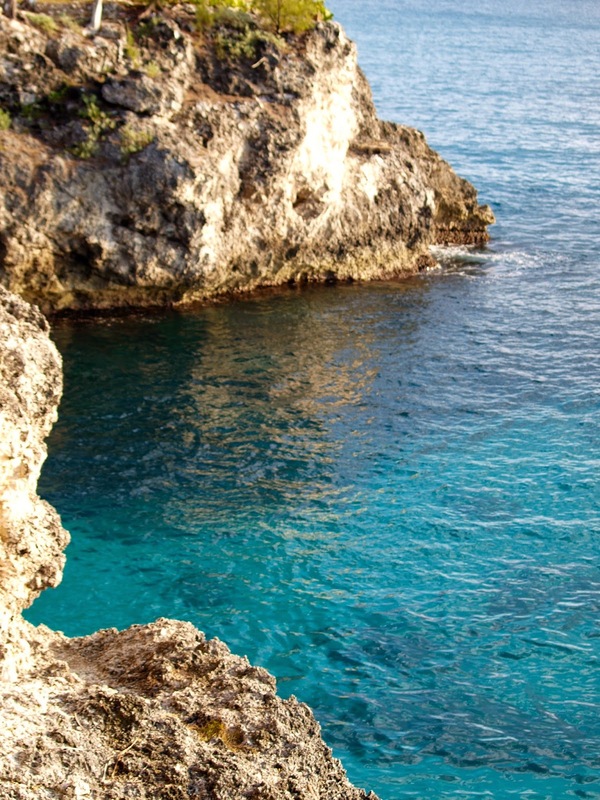 "The deep blue sea speaks to your soul, healing and soothing you. Even the act of imagining yourself dipping into it's healing womb brings about desirable effects. Better yet, spend time physically near the ocean. Allow its power and beauty to wash away all cares and concerns"
I've decided that my Bedroom needed some freshening up and I want to create a tranquil space. You may wonder what the heck this hideous little green chair has to do with that? I've been perusing Pinterest and collecting decorating ideas for my Coastal Themed Room. 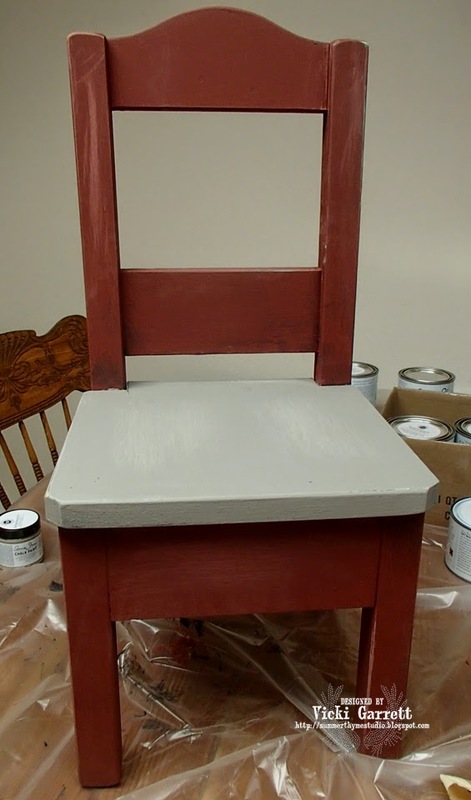 In my travels, I found some great ideas for painting furniture and decided that I definitely wanted to renew and redo my tired, mismatched, BORING wooden Furniture. 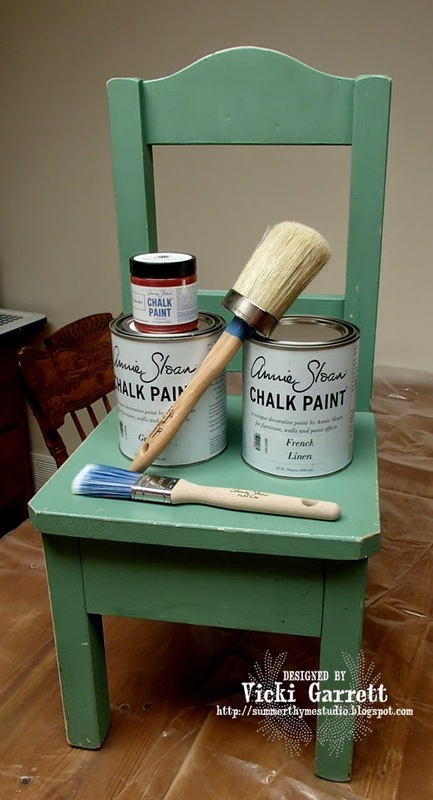 In exploring some options, I came across some wonderful samples created with Annie Sloan Chalk Paints. I found that you can't just purchase these paints at any paint store, but rather you have to find a "Stockist" who has trained with the famous Annie Sloan as a condition of carrying her line of paint. I had the wonderful opportunity of meeting Elizabeth earlier this week to stock up on some supplies and "pick her brain" for some basics with regard to using the Chalk Paints. That's where this hideous little chair comes in. Rather than tackling one of the larger items on my renew/redo list, I thought I'd start small in order to get a feel for the paint!!! 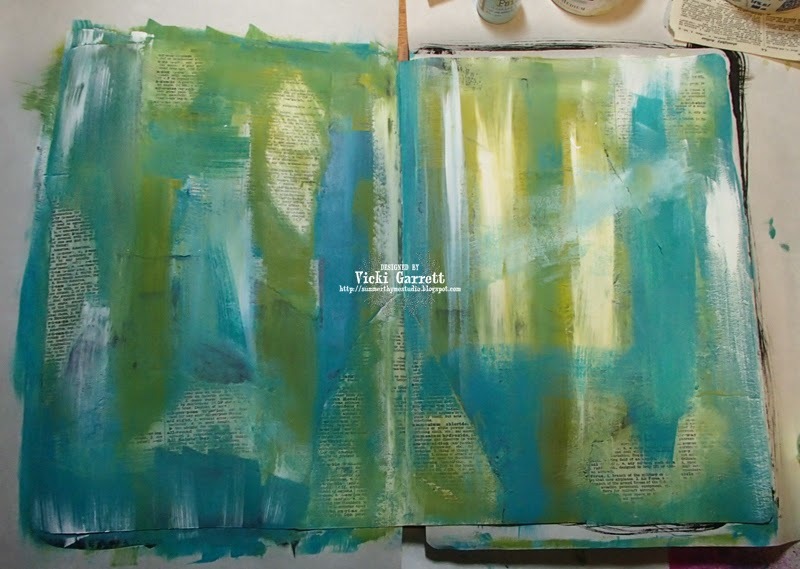 So here's a little blogography of my process! First I cleaned the chair with a little soap and water and dried it well. 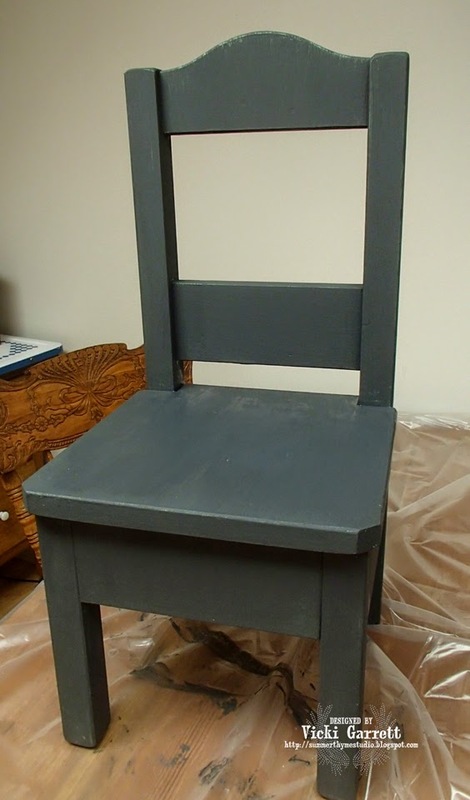 I applied two coats of Graphite for my undercoat. I must say that the paint was so very creamy and went on well. I used a damp brush to apply a lighter coat the second time through. How about this Primer Red?? Oh my GEE, I love this colour! Totally does NOT fit in with my coastal theme, but I had to get into this deliciousness right away! 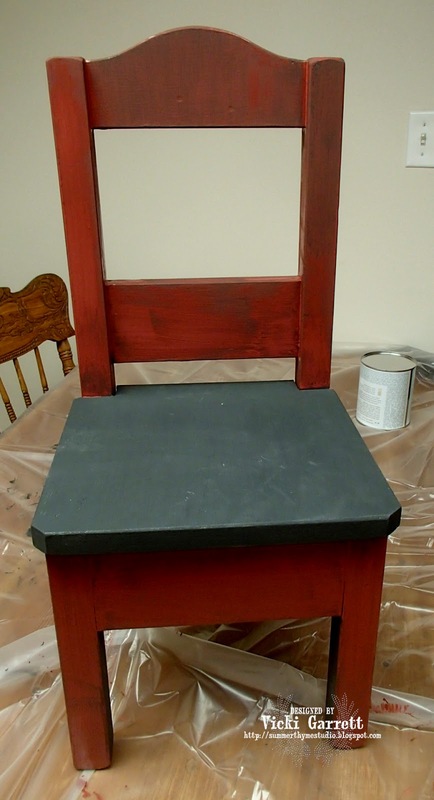 I applied two coats of the Red, leaving some of the Graphite show through. That was a little scary, but I want to create a similar effect on my larger pieces and the next time, I'm going to get a little less uniform and expose the layers even more I think! Two coats of French Linen to the seat, followed by some serious scuffing!! A coat of clear wax.......Never was partial to waxing my floors or my car, but I have to say this was kind of fun! Then the good part- the DARK wax.......again, a little scary as it is quite dark, but I applied it sparingly with the proper brush and my fears quickly faded when I realized it's actually quite nice to work with. 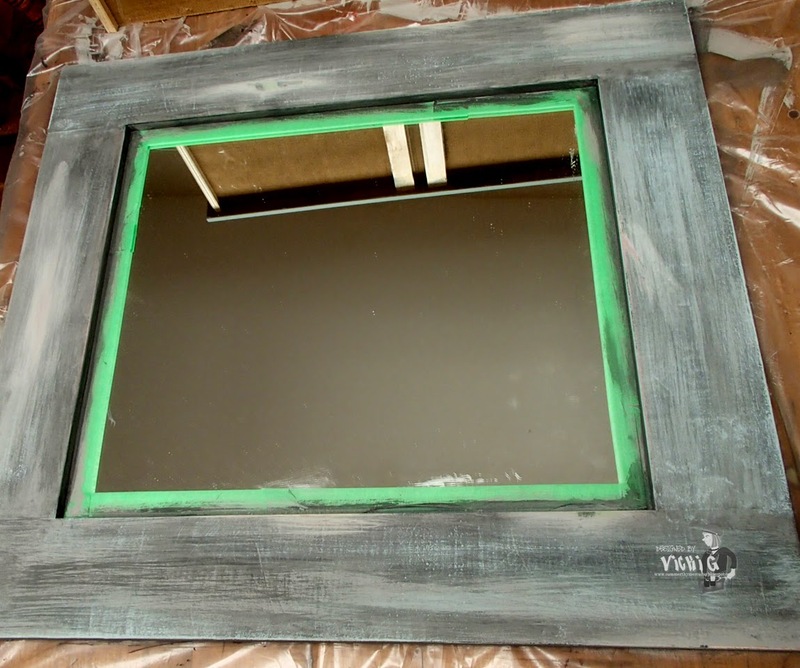 Being a Chalk paint Virgin, I must say that I'm looking forward to working on my next piece, which is a mirror that I spent many hours tole painting....... Out with the Old, in with the New! I think perhaps that there will be many many more projects in the works! What's not to LOVE- Day 3 of the Impression Obsession Blog Hop! Yep! 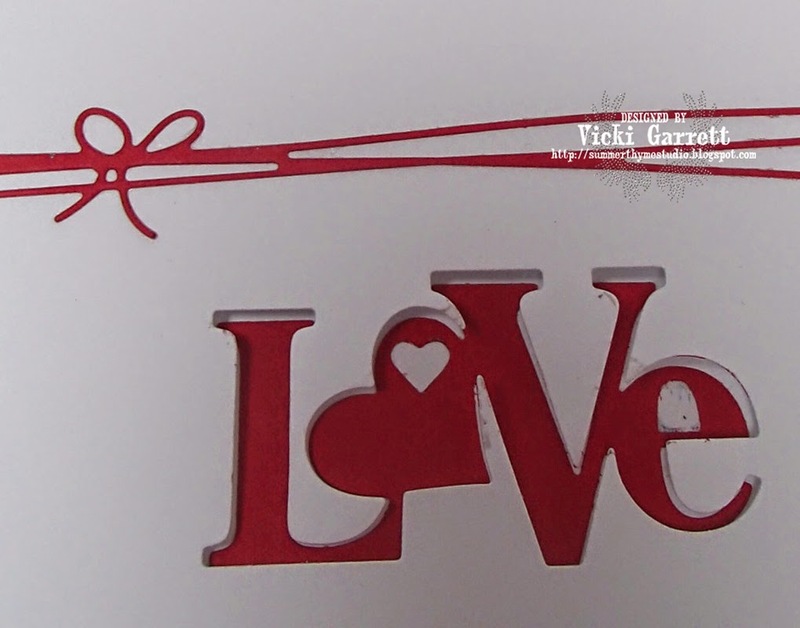 I Love the "LOVE" Die so much, I'd Love to share another card for you to Love! Make sure you visit the IO Blog to get a full list of the Designers who are posting more samples! Additionally, leave some LOVE on our posts and you may be the LOVE ly winner that gets to choose some IO Goodies!!! I decided to share two cards today, because there are so many fabulous dies in this release, that it was hard to decide to choose what to showcase! 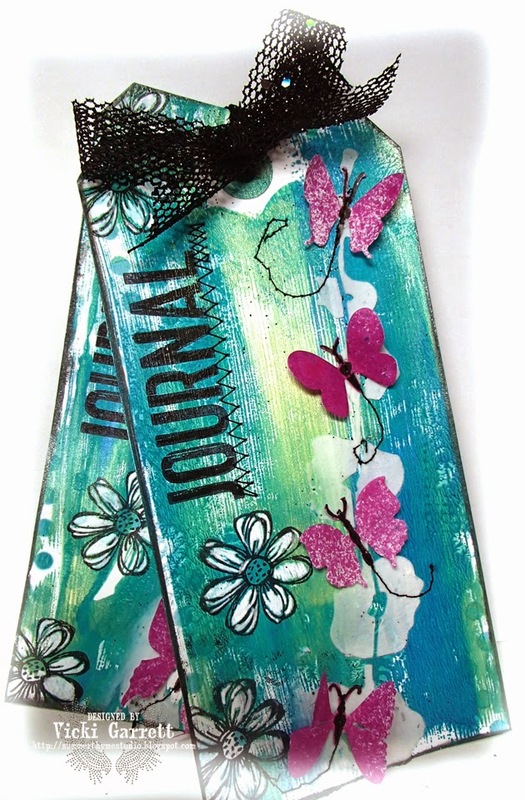 That gorgeous flower also compliments the Open Scroll Butterfly that I used on Day 1 of the Hop! 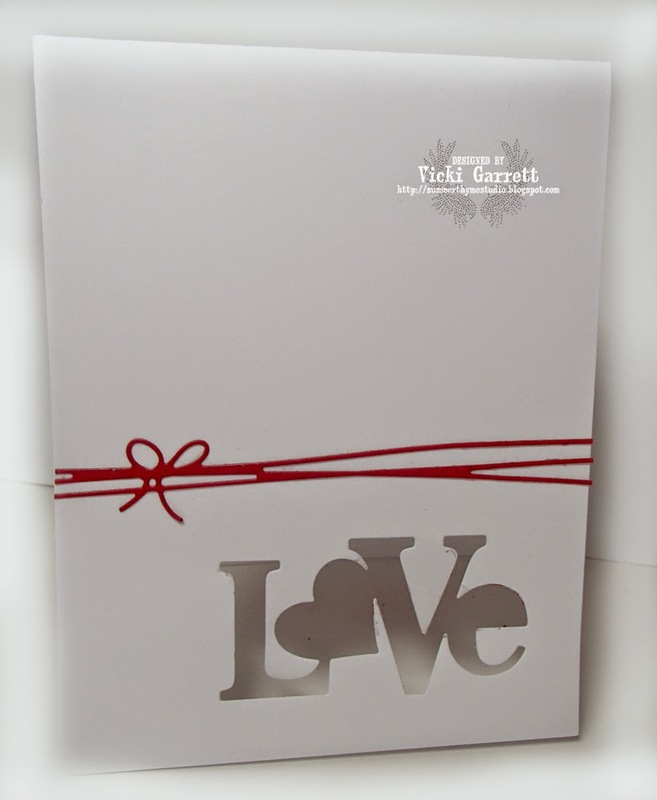 This card was a quickie, but I think it's pretty darned cute!!! 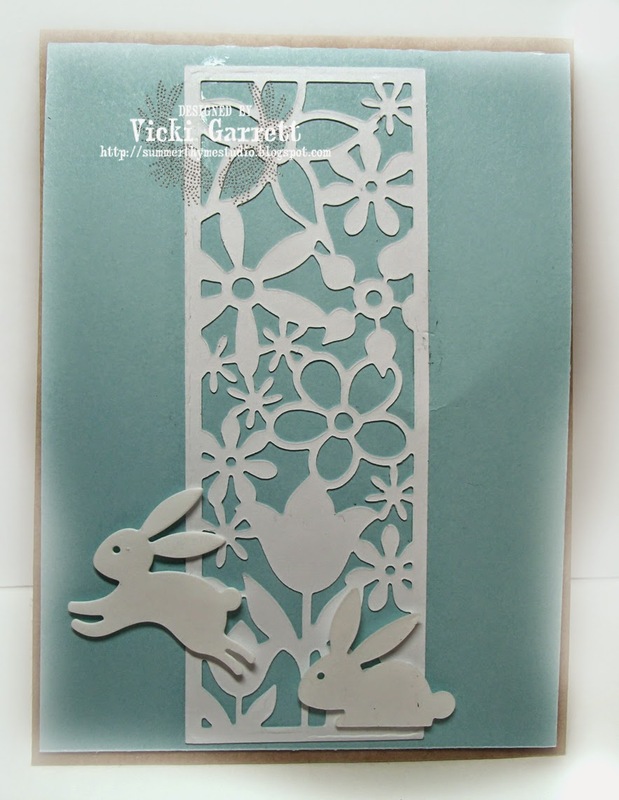 The Floral Panel Cutout is just so pretty! I read each and every one and I SO appreciate them! 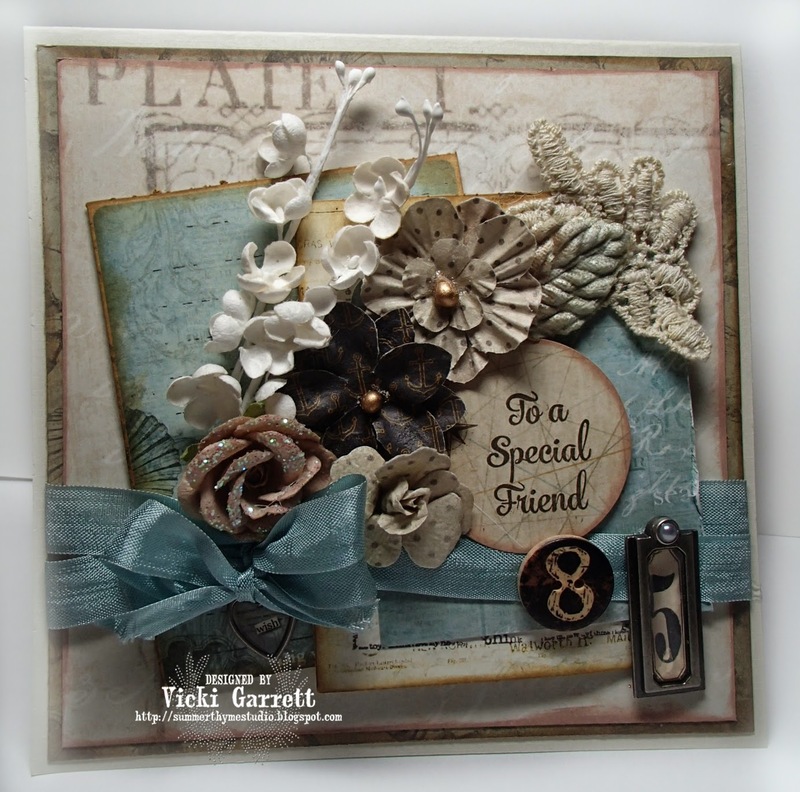 Welcome to Day 2 of the IO Stamps Blog Hop! I had a hard time capturing the look of this card, so I do apologize for the poor photography! this card is actually quite fun and funky in real life!!!! It's pretty clean and simple! That is unless I'm creating a scene! The LOVE die, which is Scrumptious!!!! I will be using the reverse image for this one a LOT i'm sure. The second die I used is The Tied Line. How fun is this? Especially when want the look of Ribbon, but don't have the right colour! This is absolutely PERFECT!!!!! Be sure you head on over to the IO Blog if you haven't been hopping already to get the full blog hop list so that you csn leave comments on each blog and win a prize!!!! 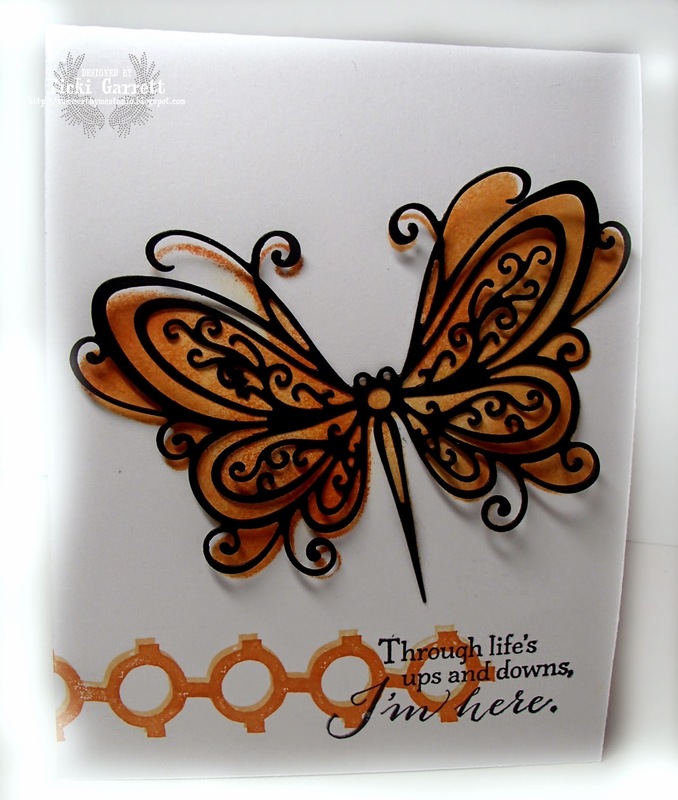 Just think of all the fun things that you could create with the new dies! Welcome to the Impression Obsession Spring Designer Die Hop! 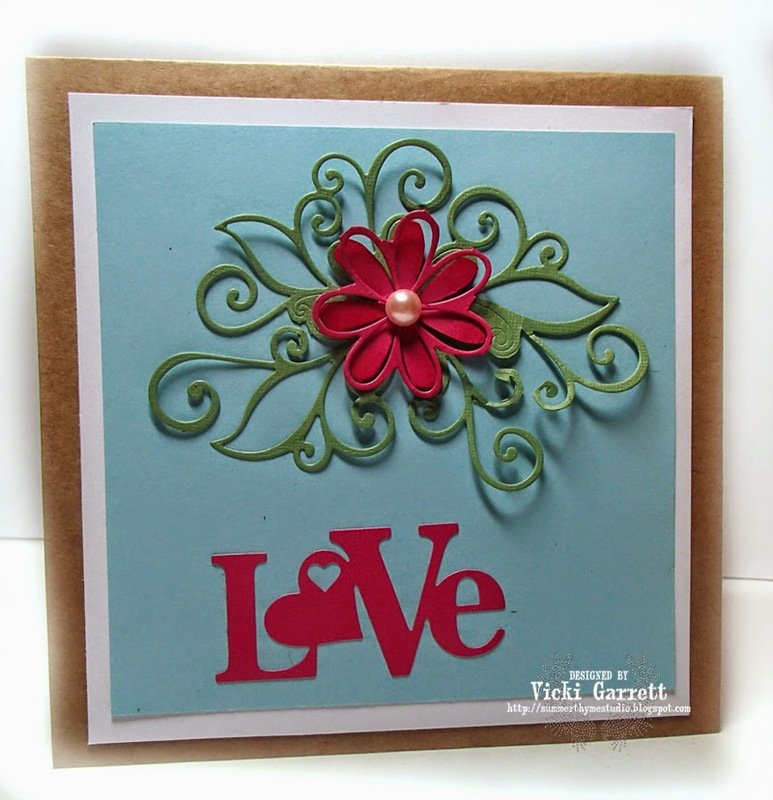 We have some beautiful new Spring dies to share AND Gift Certificates to give away! The hop will start each day (March 9th – March 11th) with a list of participants on the Impression Obsession Blog at 6am EST. The more blogs you visit each day… the better chance you will have to win a $25 Impression Obsession Gift Certificate!!! All of the new dies you’ll be seeing on the hop are available NOW! I've used it a couple of different ways to show you it's versatility. I would say it's safe to say that I'm the last stop on the fun die hop! But just to be sure, head back over to the IO Blog to hook up with all the links! Collaborative Art with my Bestie Kim! Join us as we work together in collaborations. It is a free flowing, anything goes, seat of our pants project that bounces back and forth round robin style. We never know what is coming next and it is as much fun to do as it is to watch. Get ready for Collaborations! So after watching the first video on Tags, I knew JUST the person I wanted to collaborate with. My good friend Kim Pargeter! I've stamped my tags and sent them off to her! 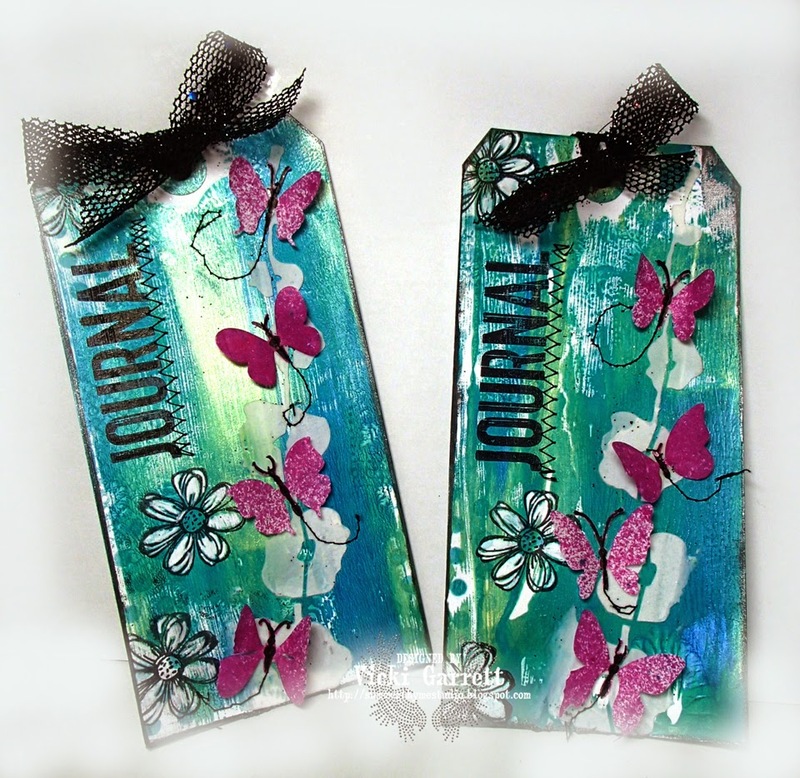 When I received her tags, she had completed the gorgeous Background and added the pretty texturized flower. I then coloured in the middles with pitt pen and sewed them down to the tag! Lastly, I added a meshy sparkly bow! i wanted to add some seam binding, but I didn't have black! It's Mail Art and I can't WAIT to share! I have been Thinking Spring for weeks now, but to no avail! It's still so darn cold here! Incidentally, that is the theme for our challenge over at IO Stamps this week! 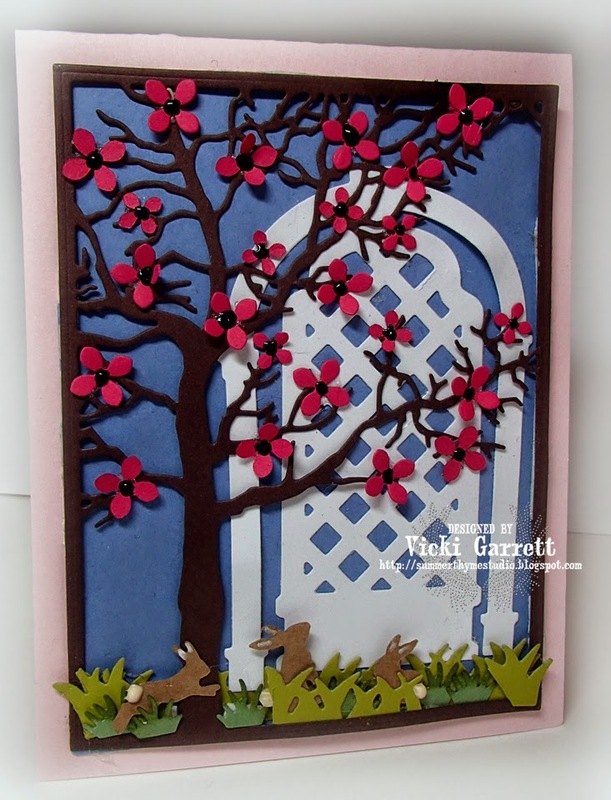 Make sure you get out your supplies and create the springiest of Spring Cards!!!! I did see Bunny tracks when I was walking Sydney the other morning, but I can't wait to see the Bunnies nibbling on the tendrils of sweet spring grass! I added a little bit of Liquid Applique to make the Bunny Tails fluffly and Some Pearl pen to the middle of the blossoms! Be sure to head on over to the IO Blog to get all the details for the challenge and to see who's playing today! Good Morning! 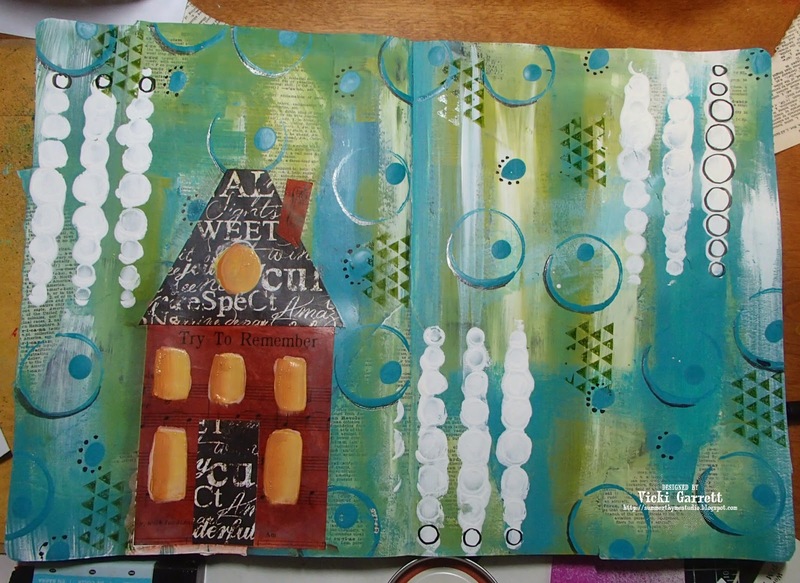 I must say that I am loving Art Journalling more and more each time I play! I like the aspect of starting with a blank canvas, not really knowing where you're going to end up. I kind of liken that to a lazy Sunday drive; no destination in mind, just a tank full of gas, a camera for capturing moments and preferably a good travel companion. That being said, I find that having a theme or prompt gives me a starting point. You had to have at least five layers on the project. and my Career of course, which I enjoy, but is also a necessity to allow me to enjoy all my leisure activities. Here is my Pictorial of my "Sunday Drive". 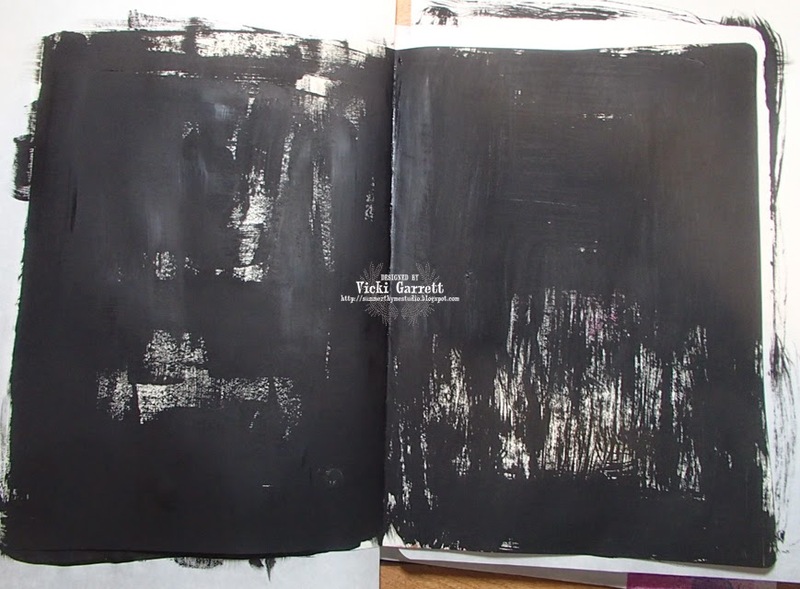 I started with a double page canvas in my Dylusions Art Journal a roughly patched in with Black Gesso. 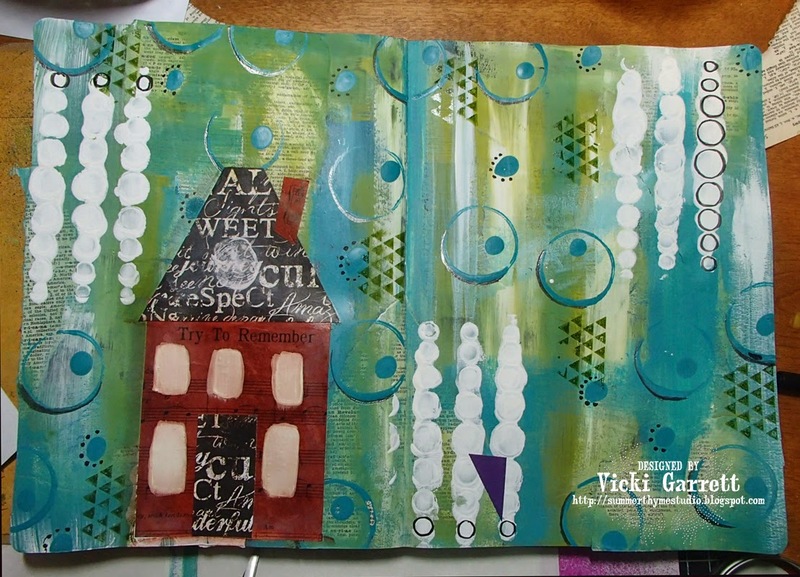 I got my inspiration for the page after participating in Kate Crane's Journal Soup 2 workshop. Ahhhh Colour!!!! 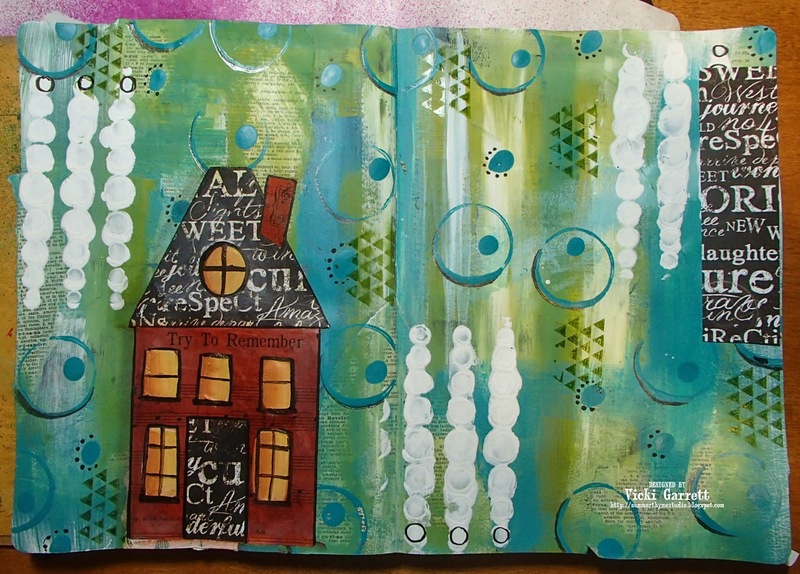 I used Tim Holtz Distress paint along with white acrylic paint to colour in a design, leaving some of the book paper showing through. 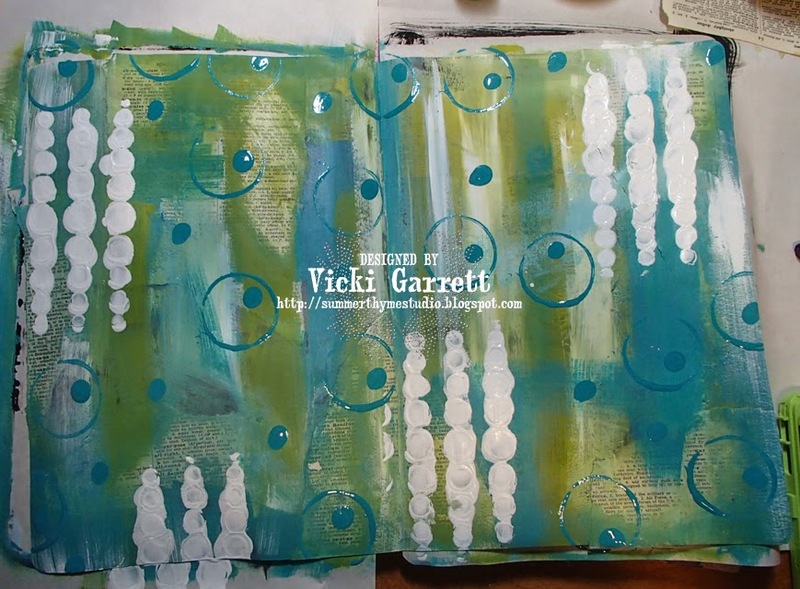 More layers, using acrylic, a stencil, a toilet paper roll and my little finger prints!! In this layer, I added some shading to the turquoise rings with charcoal pencil. And then, I built the house!!!! I used a song sheet that I had from the Musical the Fantastiks to build the base of the house and the chimney. 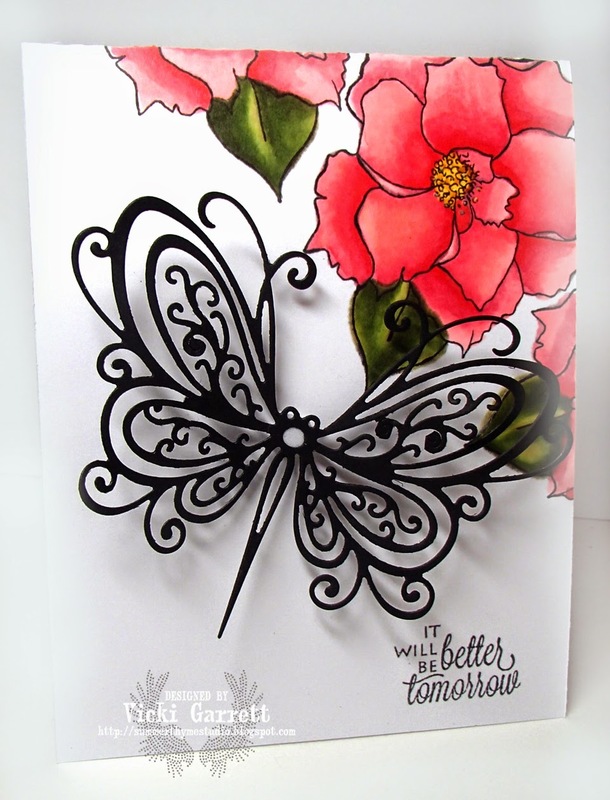 I inked over the paper with Cajun Craze ink and heat set it. The roof and door was handcut with some Graphic 45 Paper. 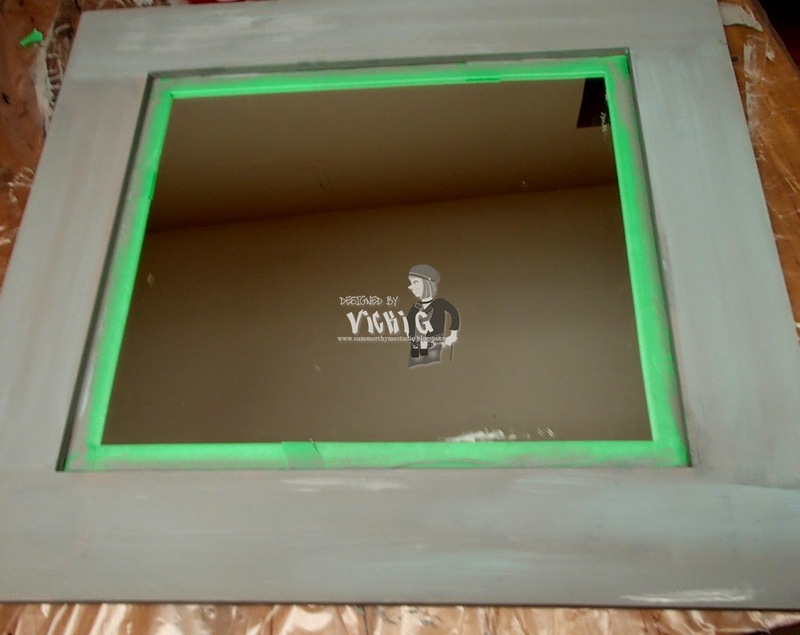 I then base painted the windows in white, adding several coats of paint to cover. 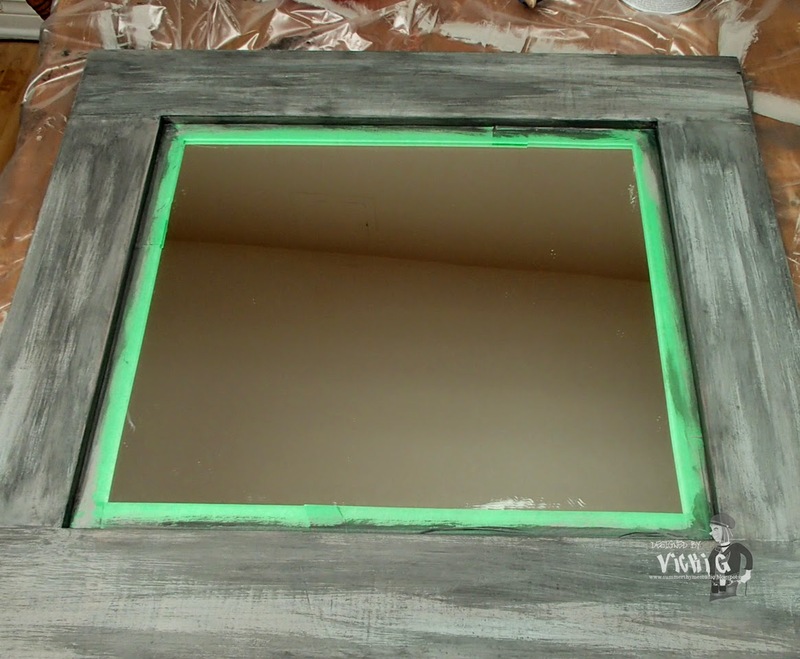 Here I added some Scattered Straw and Rusty Hinge Distress Paint to the windows to add warmth! 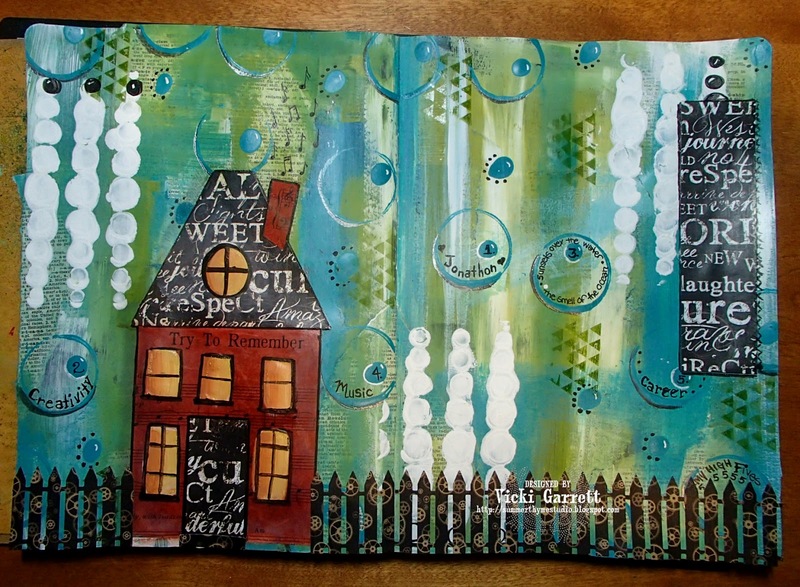 This house needed a fence, so I used this fun Fence die coupled with Paper from Graphic 45. It was about then that i cot the idea to journal my highlights into the circles. I also added some highlights in the circle with white gel pen and lastly, added some music note smoke, coming from my chimney! WAY better on the environment! I am pleased with my destination and am looking forward to next week's prompts!